If you were to have asked me about Mardi Gras 10 years ago, my likely response would have been "meh". I just didn't care - out here in California there aren't any big parades, I'm not Catholic, and no one I knew "celebrated" it in any way. In college I met a lot of people, but not one more obsessed with all things "Fat Tuesday" than Tori. 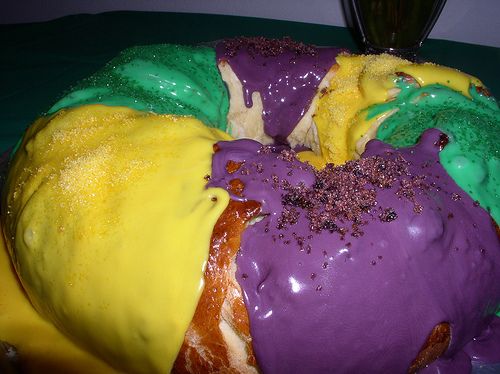 Masks, beads, Carnaval, king cake - the whole nine yards. Slowly I was turned from someone who didn't care into someone who loved one more reason to celebrate life and party down. 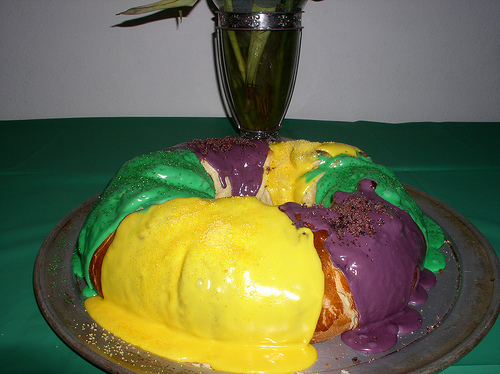 In the last few years, my celebration has evolved from "just another party" to a full blown southern feast, with vegetarian versions of southern favorites, including jambalaya, greens, corn bread, grits, drinks like hurricanes and juleps, and the aforementioned king cake. It's a simple recipe, and decorated it really stands out and makes a great centerpiece. Pour the warm water into a small shallow bowl, and sprinkle in yeast and 2 teaspoons sugar. Allow the yeast and sugar to rest for three minutes then mix thoroughly. Set bowl in a warm place for ten minutes, or until yeast bubbles up. Combine 3 1/2 cups of flour, remaining sugar, nutmeg and salt, and sift into a large mixing bowl. Separate center of mixture to form a hole and pour in yeast mixture and milk. Add egg yolks and, using a wooden spoon, slowly combine dry ingredients into the yeast/milk mixture. When mixture is smooth, beat in 8 tablespoons softened butter (1 tablespoon at a time) and continue to beat 2 minutes, or until dough can be formed into a medium-soft ball. If you have a bread machine or stand mixer, you can combine ingredients using the method you prefer. Place ball of dough on a lightly floured surface and knead like bread. While kneading, sprinkle up to 1 cup more of flour (1 tablespoon at a time) over the dough. When dough is no longer sticky, knead 10 minutes more until shiny and elastic. The dough should hold together, not be sticky, but not be overly floury or stiff either. Using a pastry brush, coat the inside of a large bowl evenly with one tablespoon softened butter. Place dough ball in the bowl and rotate until the entire surface is buttered. Cover bowl with a moderately thick kitchen towel and place in a draft-free spot for about 1 1/2 hours, or until the dough doubles in volume. Using your pastry brush, coat a large baking sheet with one tablespoon of butter and set aside. Remove dough from bowl and place on lightly floured surface. Punch dough down, and re-knead to form a ball. 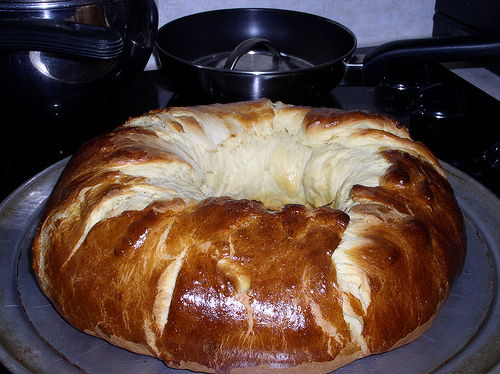 Form dough ball into a cylinder, about 1 1/2 to 2 feet long, and form it into a large circular or oblong ring on the baking sheet. Sprinkle cinnamon over the top. 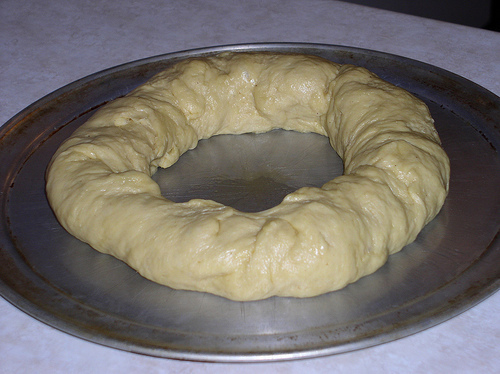 Place ring in draft-free spot for 45 minutes, or until the circle of dough doubles in volume. Brush top and sides (including inside) of dough with egg wash and bake on middle rack of oven for 25 to 35 minutes until golden brown, careful not to overcook. Cool on wire rack. If desired, you can hide the plastic baby or other trinket in the cake at this time. Pour sugar into a large bowl, add vanilla, then slowly add milk until sugar is incorporated. Icing should resemble very thick paste and be a similar consistency - if too thin, add more powdered sugar. Otherwise, it won't stick well to the cake. 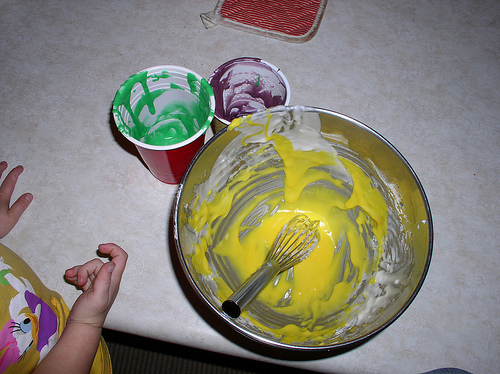 Once mixed to desired consistency, separate icing into three parts (use glass bowls or disposable plastic cups). Color each small batch with approximately 20-25 drops of coloring, ratios per directions on box. Colors should be very bright and vivid. Usually Yellow and Green are included. For purple, combine 15 drop red and 10 drops blue. Pour colored icing onto cooled cake, alternating colors as desired. To garnish, combine 1 tablespoon sugar with small amount of food coloring, and mix in a very small container with a toothpick until desired share is reached. Apply to appropriate section of cake. Notes and observations: After writing all that out, I realized that when I said "simple" above, I mean for people have some experience baking. If separating eggs, proofing dough, and mixing your own icing colors seem daunting (they were to me when I started baking), come back to this recipe when you're ready. You can ice the cake on a baker's rack so the excess drips into oblivion - I happen to think, however, that the pooled icing is both a) delicious and b) neat-looking when it comes together on the pan. But it's your cake. The bready nature of this cake means that it won't do well sitting out for long - don't bake it more than a day before you plan on eating it. You'll also want to decorate it just a few hours before you serve it - that gives the icing time to set some, but not enough to get hard. The cake goes well with a small scoop of vanilla ice cream to balance textures. Enjoy! The colors here are quite alarming. Love it! That, my friend, is what I call a party on a plate. I love that photo with Katie's little hands! She must have had tons of fun with this recipe. This page contains a single entry by Michael Doss published on February 23, 2009 2:05 PM. Thank you, Little Caesar's! was the previous entry in this blog. On Water is the next entry in this blog.